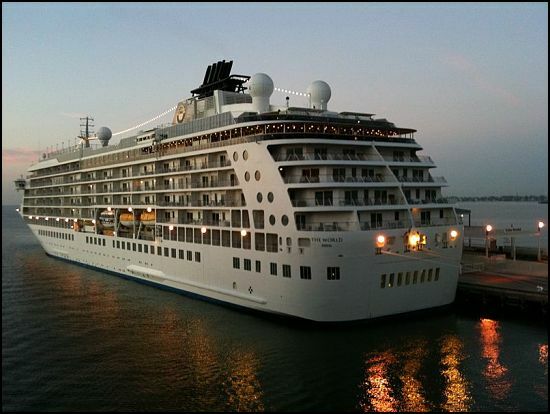 The idea of Knut U. Kloster, whose family had a long history in the cruise ship industry, the World is a cruise ship which serves as a residential community owned by its residents. Launched in March 2002 and purchased by the residents in October 2003, The World is home to the residents from 40 different countries. Although some live on board full time and the others visit periodically over the year. The World’s hull has been built in Landskrona, Sweden, by Öresundsvarvet, and it had then been towed to Fosen Mekaniske Verksted in Rissa, Norway, for completion. It has 165 residential units (106 apartments, 19 studio apartments, and 40 studios), all owned by the ship’s residents and it carries between 100 and 300 residents and their guests. With gross tonnage of 43,524 tons, the cruise is 644 feet (196 m) long, 98 feet (30 m) wide, and has a 22-foot (6.7 m) draft, 12 decks, and a maximum speed of 18.5 knots (34.3 km/h). The World flies the flag of Bahamas. The massive ship is operated by ResidenSea, headquartered in Miramar, Florida. It has remained the management company responsible for the ship’s operation and administration which includes hiring the hundreds of employees that offer services such as housekeeping, beauty treatments, photography and other amenities. Moreover, residents are also involved in the ship’s management. They, through their elected board of directors and a network of committees provide further guidance to the top management about the ship’s itinerary, finances and lifestyle. Just like the ship, the facilities offered are enormous. Ranging from small grocery store and delicatessen, a boutique, athletic facilities that include a golf simulator, putting green, full-sized tennis court, jogging track and gym to six restaurants that supplement the kitchens or kitchenettes in most of the apartments and dining ashore, the World is any sea lover’s dream. Apart from the above, the World also provides on board entertainment like movie theatre, library and music performances. Not only this, you can even learn while you are aboard. The World offers classes in topics such as dance, navigation, language, cooking, arts and crafts, music, computers, and photography. Internet is also accessible in each residence. The World became the largest passenger vessel to transit the Northwest Passage by setting sail from Nome, Alaska, USA on 18 Aug 2012 and reaching Nuuk, Greenland on 12 Sept 2012. The ship, carried 481 passengers and crew, for 26 days and 4,800 nautical miles at sea, had followed in the path of Captain Roald Amundsen, the first sailor to complete the journey in 1906. As of 2010, Studio (Ocean Studio 661), 328 sq ft (30.5 m2) costs you US$600,000. Two Bed (Ocean Residence 1006), 2 bedroom, 2.5 bath is at the price of US$2,950,000 and Suite’s (World Suite 1108/1110) list price is US$13,500,000. Monthly homeowner dues range from $20,000 per month (for the smaller units) and up, and cover fuel, crew, maintenance and a meal allowance for the owner. In short, the World actually gives its residents a world on sea. Next article The Last Living Photos Of 25 Famous Figures. The Last Living Photos Of 25 Famous Figures.